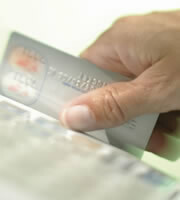 From the start of the credit crunch, through the recession and beyond, we at IndexCreditCards.com frequently focused on credit card debt. We knew a lot of our readers were hurting, so we offered advice to them, and to others who still had time to avoid the pain. And we raged against card issuers when they started lending again to near- and sub-prime borrowers. Then, some months ago, we decided to largely move on from such topics: the economic recovery was gaining real traction, and debt was a much smaller issue for most people. Instead we often encouraged people to use their credit cards more, although only if they could do so responsibly. We frequently highlighted the advantages: not just rewards, but also consumer benefits and perks such as extended warranties, purchase protection and price protection. It looks as if we may have read the zeitgeist correctly. On July 8, the Federal Reserve published its monthly consumer credit analysis. The data, which covered May, showed a huge leap in "revolving credit," which is nearly all credit card debt. That month's rise was at an annualized rate of 9.3 percent, and took the dollar amount owed to $856.5 billion, up from $849.9 billion in April. That's probably good news. When CBS News covered the Fed's figures, its reporter said: "More credit card borrowing could help boost consumer spending, which accounts for 70 percent of economic activity." And it went on to quote Barclays Research economist Cooper Howes, who predicted that card use was unlikely to reach pre-recession levels anytime soon. Certainly, the numbers struggling with card debt are very encouraging. On July 9, American Bankers Association data that showed card delinquencies (when people fall behind with payments) at a 23-year low. At 2.24 percent during the first quarter of this year, the rate was way below the average over the last 15 years, which was 3.87 percent. So a bit more card debt may be a good thing for the economy, while posing few immediate risks for responsible consumers. However, the risk for the irresponsible remains the same as ever. In fact, the implications for a consumer who defaults on a card may be more damaging than they were before the credit crunch. So, what's changed? Well, it looks as if some credit card companies were overwhelmed by the sheer volume of defaults that arose when the economy smashed into the brick wall that was the credit-crunch, and cut corners to cope. For a long time, it's been common practice for card issuers to sell off bad debts to collection agencies when they've exhausted in-house efforts to reach settlements with consumers. When the number of defaults reached unmanageable levels, these companies lost control and sold some debts with incomplete or inaccurate information. Worse, some started "robo-signing" affidavits and other legal documents, which meant they were certifying "facts" for courts without first checking. Things have gotten so bad that one of America's biggest credit card companies, which a couple of years ago stopped pursuing its own court actions, seems now to have ceased selling on bad debts to third parties, according to a July 1 report from Collections & Credit Risk, a trade journal for the collections industry. That report went on to quote unnamed sources who claimed the action was a result of "concerns that such sales could cause further damage to its [the card issuer's] reputation…"
You're still going to have to pay! So, in effect, a major card company has stopped using the courts to collect its debts. Does that mean its debtors will get away scot-free? For most, that's pretty unlikely. Collections & Credit Risk reckons that issuer alone recovered $1.4 billion in bad card debt in 2011, and nobody walks away from that sort of money. Instead, it and other issuers are likely to invest heavily in improving their systems so that they can comply with the needs of customers, courts, and state and federal regulators. And that may make it even harder for those who can't or won't pay to escape their obligations. So, for those spending more on their cards than they can afford to pay back, the day of reckoning is still going to come. 0 Responses to "Using your credit cards more? Payback time's coming"